Little Mix’s new single is apparently called ‘Black Magic’. Witched! – MP! Little Mix’s new single is apparently called ‘Black Magic’. Witched! 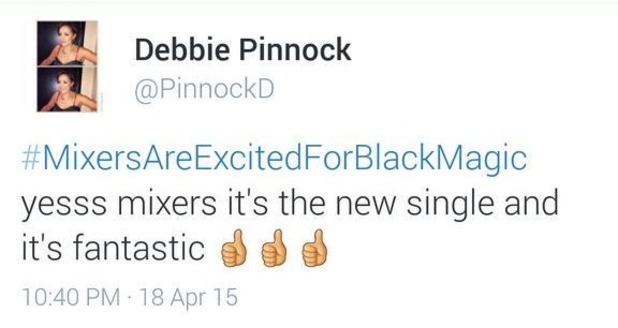 Leigh Anne Pinnock’s mother Debbie is excited as much as we are to listen to Little Mix new material that she accidentally tweeted, and kinda confirmed, that the next Little Mix’s brand shiny and new single is titled ‘Black Magic’. While we’re patiently waiting for this LM tune to be dropped don’t miss Little Mix live comeback at Ray of Sunshine charity gig! Next article Introducing Tallia Storm: The Scottish pop princess who’s already found a fan in Sir Elton John.